Washington and Lee was saddened to hear of the passing in January of a venerable alumnus, Frederick Bartenstein Jr. ’39, ‘41L, at the age of 100. 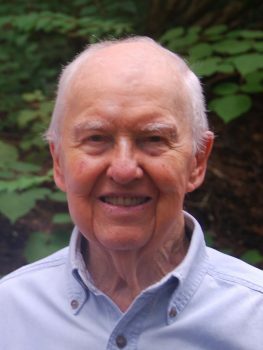 An amateur historian who was passionate about education, Bartenstein transferred appreciated Merck & Co. stock many years ago to a charitable remainder unitrust, reducing capital gains, producing an immediate charitable tax deduction, providing him income during his lifetime, and strengthening W&L, as well as other remainder beneficiaries. Upon his death, the proceeds were divided among three institutions dear to his heart: New Jersey’s Pingry School, where he educated his four sons and served as a trustee for many years; Wellesley College, the alma mater of his late wife, Isabel Burnham Anderson ’44; and his own alma mater, Washington and Lee. The Bartenstein gift helped with the renovation of the Indoor Athletic Facility, as well as funding the Frederick Bartenstein ’39, ‘41L Scholarship Endowment, which will provide both undergraduate and law school scholarships. The son of a W&L alumnus — Frederick Bartenstein Sr. ’08 — Bartenstein Jr. was a scholarship and work-study student. While at W&L, his father had majored in civil engineering and, after graduating, headed west to work in the oil business. However, following a family tragedy, he was called home to Virginia by his parents. Once back, Bartenstein Sr. shifted careers and became a managing partner in an apple orchard. Then, when his son Fred Jr. was in high school, the Depression hit. It was an interesting set-up at Sunnyside,” continued Fred Bartenstein III. “The house was divided into two separate households. On one side VMI reigned, where Col. Anderson raised his two sons. The other was the W&L domain, overseen by the two unmarried sisters, who raised the Anderson’s daughters, Helen and Isabel.” Isabel Anderson and Bartenstein Jr. soon became smitten with each other, but put off marrying until her Wellesley studies and wartime job ended. The pharmaceutical company, Merck & Co., moved Bartenstein to its home office in New Jersey, where he served as general counsel from 1953 to 1961 and spent the last 11 years of his 30-year career as administrative vice president, with responsibility for corporate legal, patent, public relations, economic research, and long-range planning. He was also president of the Merck Co. Foundation (1970–72) and active with the Pharmaceutical Manufacturers Association. He and Isabel were married at Sunnyside in 1947; their marriage lasted 51 years, until her death in 1998. The extended family always maintained its ties to Lexington, spending every Christmas and summer at the farm there. Isabel, wanting to ensure that all her children would be Virginians, returned home for the birth of each of her four children, all boys. Their second son, Arthur, a landscape architect, returned to Lexington in 1990. “Our father remained a quintessential Virginia gentleman; he always aspired to that ideal and adhered to the highest standard of ethics,” agreed Fred and Arthur. “He fully intended that we would go to W&L,” Fred added. In this he was disappointed — his sons, as they often do, had other ideas. Two went to Harvard, another to Hampshire, and yet another to Swarthmore. After retirement, Bartenstein engaged in consulting, board service — including 30 years, five as chairman, of the Pingry School board, and historical research. He and Isabel researched and co-authored “New Jersey Brigade Encampment in the Winter of 1779–1780” — honored as the most distinguished article to appear in the journal New Jersey History in 1968 — and a book, “A Report on New Jersey’s Revolutionary Powder Mill,” in 1975. Both were conservationists, protecting family properties in New Jersey and Virginia, as well as leaders in efforts to preserve New Jersey’s Great Swamp and the New Jersey Brigade Encampment Site, now part of Morristown National Historical Park. For more information on bequests and beneficiary designations, or IRA Charitable Rollovers, please contact Margie Lippard in the Office of Gift Planning at mlippard@edu.